Gareth Dickson has spent the last 3 years touring with Vashti Bunyan as her guitarist and he had the opportunity to work with great musicians like Juana Molina (a stunning duet of Gareth’s Two Trains here) and Max Richter, as well as the chance to perform in some of the great venues all over the world from the Barbican (London) to Carnegie Hall (NY) and tour with Isobel Campbell & Mark Lanegan. 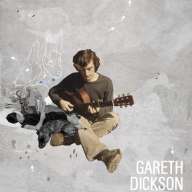 Gareth, who hails from Scotland, writes beatiful folksongs using a steel stringed acoustic guitar and effects (delay and reverb) in his quest to recreate the ambiance of some of his more recent musical influences (Aphex Twin, Brian Eno) while drawing on the guitar techniques of some of the finger-picker guitarists of the past (Bert Jansch, Robert Johnson, Nick Drake) and creating ambient textures that bring forth memories of Labraford or Gastr Del Sol. He will tour around Europe until may (check out the dates) and he is planning to keep touring for a Nick Drake tribute (called Nicked Drake, with some great covers, like From The Morning, streaming on his vimeo channel). Update (Aug 21st 2010): New album The Dance is out now! “From Glasgow, this beautiful music: a solo artist singing and playing acoustic guitar – sometimes effected, his songs slip between a beautifully sparse, emotive fragility (recalling Nick Drake, Bert Jansch, etc.) and denser instrumentals (recalling Eno or Labradford). Very cool stuff.” Fatcat Records. I live in a small town called East Kilbride, just outside Glasgow in Scotland. But i have spent a fair bit of time living in Argentina over the past few years with my girlfriend. Beans and waffles that my sister made. Don’t really have one to be honest. Possibly playing guitar, if i don’t get to play for more than a couple of days for whatever reason i get a bit tetchy. Nothing, i don’t really like the idea of collecting for the sake of it. I have a collection of cds and books and that’s about it. I love Churchill’s quotes, to choose one at random would be: “I cannot forecast to you the action of Russia. It is a riddle wrapped in a mystery inside an enigma” but i’m sure there are better ones, there are loads of great ones. The basement of my house where my cousin and friends come on a saturday night to have a wee drink. Again too difficult to name one, but if i had to… I went to a recital of Indian classical music a few years back in Glasgow. It was music that should be traditionally played at night so the concert started around 1am and went on until dawn from what i remember. There was a break with vegetarian food so that was great too. The music nearly knocked me over from the instant i went in to the hall, i’d never heard anything like it before. And the performers were completely relaxed and even commented on each other’s playing during the pieces. If they started out of tune they would just tune up with one hand while keeping something going with the other. Not like most concerts you see, especially western classical ones. From the melodies i heard that night i got the idea for Amber Sky. California, i was lucky enough to go there to play some gigs with Vashti Bunyan a couple of years back. I love L.A because it’s totally unique and completely nuts and has an amazing beach, and San Francisco is great, and Joshua Tree national park, and the Grand Canyon (not actually in California but close enough to drive to). I just love the mixture of all of these amazing places in this one area. The summit of Everest with a big jacket on.